Item from a binder labelled 'Stirling Odds & Ends', comprising a photocopy of Kathleen Bailey's inventory of historic buildings in Stirling, Ontario, compiled in 1968. Newspaper article on the Abbott family house in Trenton. Includes photographs. Newspaper clipping (possibly from the Intelligencer newspaper of Belleville) with a photograph of the construction of the piers of the new Skyway Bridge at Green Point in Prince Edward County, Ontario. File contains newspaper clippings on the history of the Bay Bridge, and the tolls that were placed on the bridge and the effect on the public. The file contains a newspaper article titled "Family Maintains Ice-Watch Tradition" about a home on Dundas St. West were the garage (former carriage house) has the dates of the ice melt on the Bay of Quinte dating back to 1921. 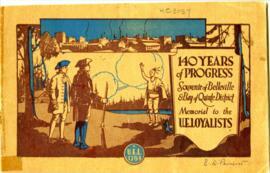 File contains letters written by members of the Belleville and Bay Bridge Historical Society, ca. 1899.